This was our view from our office this afternoon – a beautiful snowflake patterned frosted window. Jack Frost nipping for certain with afternoon temperatures barely above zero and now tonight at zero or maybe less. Outlook for tomorrow includes warmer temps than the last few days with more snow probable. A lovely start to the holiday season. Many of Idaho’s ski areas are now open or opening this weekend. At Dog Bark Park the big dog is now closed for the winter & will re-open for overnight visitors next April. Meanwhile holiday orders for our chainsaw carved wooden canines are keeping us plenty busy in the studio where the wood stove has been working overtime buring our scrap wood keeping us warm & happy these extra-cold days. We have a good selection of small-size carvings in stock for quick shipping. Also our Dog Bark Park mugs & selected sizes of t-shirts & ladies polos. Phone for details/pricing. We enjoyed making these two custom dogs (Akita & Beagle )that mailed out to the new families this week. 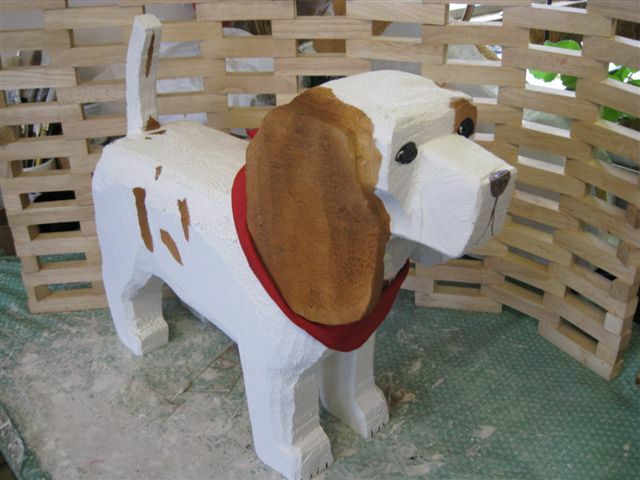 Customers usually send photos of their dogs for us to use as guides in painting the carving to look like their special pet. And if photos aren’t available we often can work from descriptions of the dog’s markings. We hope their new owners are pleased, too. Enjoy Thanksgiving. And if Jack Frost decorates your windows, enjoy the magical configurations & think of warmer days ahead!